Although born to a life of privilege and married to the President of the United States, Eleanor Roosevelt was a staunch and lifelong advocate for workers and a proud member of the AFL-CIO’s Newspaper Guild for more than twenty-five years. She Was One of Us tells for the first time the story of her deep and lasting ties to the American labor movement. Today, union membership has declined to levels not seen since the Great Depression, and the silencing of American workers has contributed to rising inequality. 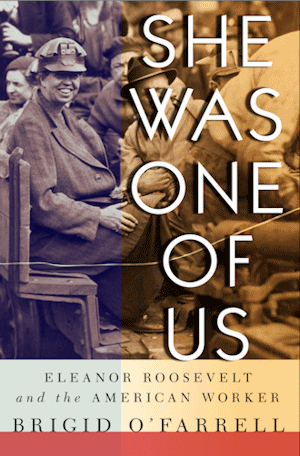 In She Was One of Us, Eleanor Roosevelt’s voice can once again be heard by those still working for social justice and human rights. Webinar: Bookmark in Labor History, Self-Paced Learning Module, AFSCME Education Department, March, 2013 (http://www.afscme.org/members/education-and-trainings/womens-leadership-training). A new Workshop Guide engages women workers in using the inspiring words and rich historical record of Eleanor Roosevelt and her union women allies to organize and lead today. With funding from the Berger-Marks Foundation O’Farrell travelled to ten union women’s conferences and schools to develop a flexible guide, with handouts, optional small group discussions, a brief biography, and a slide presentation. Funding for social media links was provided by the 21st Century ILGWU Heritage Fund. For more information see the Workshop Guide. Stu Levitan, Books and Beats, Madison’s Progressive Talk Radio, 92.1, March 27, 2011. “An important and powerful book about one of the greatest friends labor has ever had. An in-depth conversation about ER, FDR, Walter Reuther, John L. Lewis, et al. (Are you listening, Governor?)”. Podcast link. The Denver Post, Local Best Sellers, She Was One of Us in the top 10, January 17, 2011.